The i1 Filmmaker Kit was created for discerning filmmakers looking for the highest level of on-screen color accuracy and the ability to achieve ideal color balance from shoot to edit. 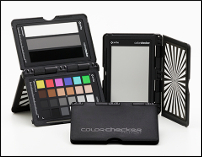 ColorChecker Passport Video, a convenient pocket-sized target kit to quickly get you to a worry-free, color balanced and consistently neutral place with ideal camera exposure. 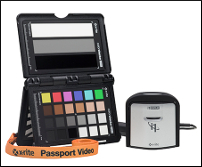 Combining two essential color management tools in this handy kit offers filmmakers the convenience of a single purchase at a lower price than components purchased individually. i1Display Pro is the Industry-recognized professional display calibration system with unrivaled color accuracy on all modern display technologies including LED, Plasma, RG Phosphor, OLED & Wide Gamut. ColorChecker Passport Video is the next evolution of the original 24-patch Macbeth ColorChecker, now celebrating 40 years as an industry standard. The i1 Filmmaker Kit incorporates the ideal workflow tools needed by hobbyist and professional filmmakers for capturing and editing footage, bringing ideal color balance to the filmmaking production workflow. 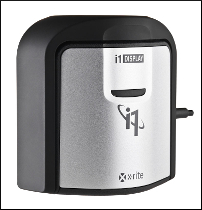 i1Display colorimeter, i1Profiler profiling software for displays and projectors, PANTONE Color Manager software and Quick Start Guide. Color Perfectionists shouldnÕt guess when it comes to on-screen color accuracy. The color you see on your monitor or projector is the color you should expect from your printer. Once you take the guesswork and frustration out of calibrating and profiling your displays, youÕll save time and money while gaining full creative control over your images. i1Display incorporates new technologically advanced filter and optical systems, amazingly fast measurement speed, and unrivaled color accuracy on all modern display technologies including LED & Wide Gamut LCDs. ItÕs also spectrally calibrated, which makes it field upgradeable to support future display technologies. The ultra-modern ergonomic design incorporates three functions Ð ambient light measurement, monitor profiling, and projector profiling Ð into a very sleek, compact and fully integrated device with no parts to misplace. The next generation of our top of the line color management software offers the ultimate in flexibility and control. ÒBasicÓ mode offers a wizard driven interface with predefined options for the quickest path to professional on-screen color. ÒAdvancedÓ mode offers user-defined options for more sophisticated profiling workflows to deliver the highest quality color results on monitors and projectors, as well as display testing and quality assurance tools. No matter which mode you use, youÕll be able to attain professional color results for a more perfect match between your display and printer. Workflow Flexibility Ð advanced user-defined controls support more sophisticated workflows. For example, White Point can be set from predefined values, custom xy values, based on measurement of ambient light, based on measurement of another display, or from previously measured values, etc.